Have you heard of this vegetable before? I vaguely remembered hearing about it, until recently when I found to my delight that they were being stocked in my local fruit and vegetable store. If you are in the states, and possibly the UK, I am under the assumption that these are commonly available along with other varieties of the squash family. Until recently, here in Australia (and sub-tropical Queensland in particular), they were rarely seen. The only squash we are familiar with are the small yellow button variety and Butternut squash, which we call Butternut pumpkin here. Just to be confusing! The producers are the Milano Brothers in Victoria who have a facebook page called ‘Vegetable Spaghetti’ with information and recipes about the vegetable. They also list their suppliers around Australia, so you can go ahead and source some in your local area too! The first time I cooked it without following the instructions listed on their label about boiling the squash, and instead took the advice of the cashier who said he preferred it baked. He instructed me to simply cut it in half lengthways, drizzle with olive oil and bake in a moderate oven for about 45 mins- 1 hr. On this occasion I baked it and added it to a jar of pasta sauce. The texture was perhaps a little too ‘al dente’, as I had not been sure how long to cook it for. Despite this it was delicious and got the ‘thumbs’ up from my kids. The second time I cooked it I boiled it as per the instructions in the above picture. This method yields a mushier ‘spaghetti’ and is not my preferred version. I continued to cook it for many months following the first (bake) method and we all enjoyed it each time. However, I recently stumbled across this youtube clip by Against All Grain’s Danielle Walker- where she shares her own method of preparing the spaghetti squash- and I haven’t looked back! This method was third-time lucky for me. 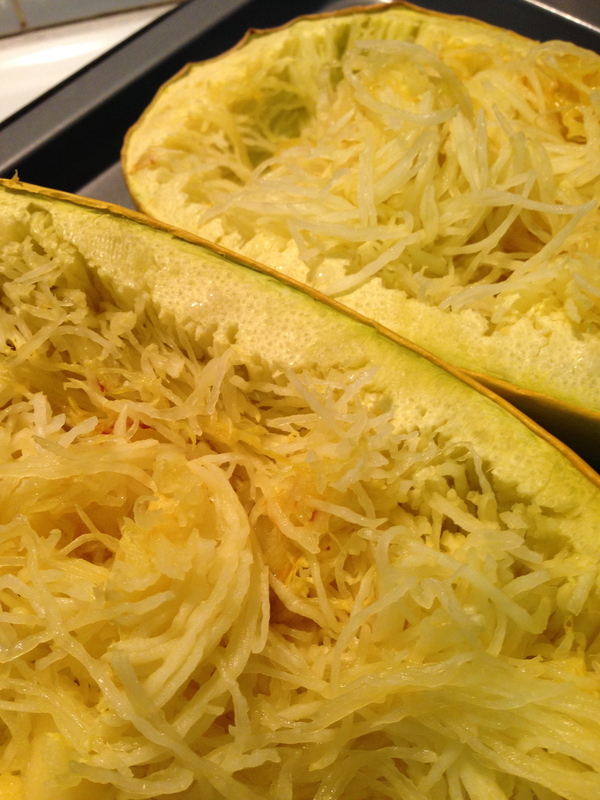 Let me know if you already love Spaghetti Squash, or if you try it for the first time after reading this! Before and after scooping out. Sooooooo…..I should tell you this, in case you get disappointed later. Why would you be bothered?? If I really wanted a Kit-kat , I would eat a Kit-kat. Paleo (or grain-free or JERFing or just your eating way) is about finding a ‘new normal’- eating simple, wholesome, quality, real foods. Keeping It Simple Stupid. Less is more! Erm, so why am I posting a recipe for Paleo Lasagne? Because it required minimal effort, was no more labour-intensive than the original version is and….. I wanted to! Fry onion until glassy. Add crushed garlic before adding beef mince. Brown mince and break up lumps, for 3-5 minutes. Add tomato paste, tomato, tamari and herbs. Reduce to low and let simmer for 20-30 minutes, or slow-cook for longer for a richer sauce. Thinly slice Zucchini length-ways using a Mandolin or similar. (I don’t have one, so I used a cheese slicer which worked a treat). Steam cauliflower until tender. Add to food processor with other ingredients. Blend until creamy. Layer each part as many times as you like. I only did two layers due to the size of my tray. Mince, Zucchini, white sauce and repeat! 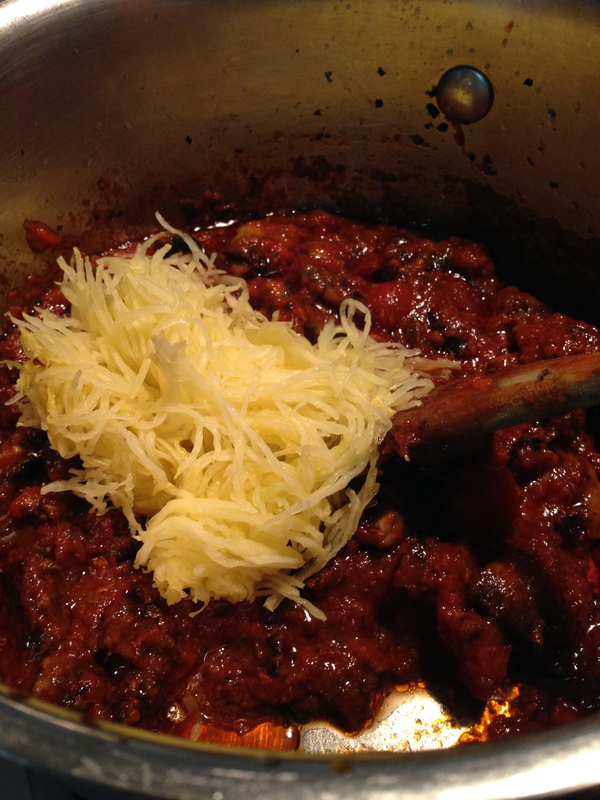 Sprinkle top layer with grated Parmesan or Goat’s pecorino (Optional. You could also use nut cheese). Bake in a pre-heated oven on 170c fan-forced/190c for 20-25 minutes, until brown on top (if using cheese). You can do the first step earlier and refrigerate the cooked mince until later. I did this to save on preparation time in the afternoon. You can use more tomato paste and also canned tomatoes if you wish. I personally have issues with nightshades so I limit rich tomato dishes. If you have a large dish and want to do more layers, use 4-6 zucchinis. This dish was kid, husband and house-guest approved! I hope you and your family like it too.